The Rocky Ridge Neighbors began a collaborating with Mill Creek MetroParks in 2012 to tap the trees in the Charles S. Robinson Maple Grove, located to the west of the Wick Recreation Area. The maple grove, named after a former Mill Creek park commissioner, was planted in 1951. The Neighbors had the idea of tapping the trees and distributing the syrup proceeds to the park as well as other projects that will benefit the surrounding area. Mill Creek Maple Syrup helped Rocky Ridge contribute to the Julianna Kurinka Children’s Play Area, Mill Creek Junior Baseball and the West Side Library (read more about this donation). The Neighbors hope to be able to add more causes to this list as the project continues! In 2014, the Neighbors unveiled the Rocky Ridge Sugar House. Located in the grove, the site houses all syrup production. Mill Creek Maple Syrup is a project that the Rocky Ridge Neighbors take great pride in and it is one that promotes community involvement. Syrup collection occurs during February and March and is later sold in the spring at Fellows Riverside Gardens. 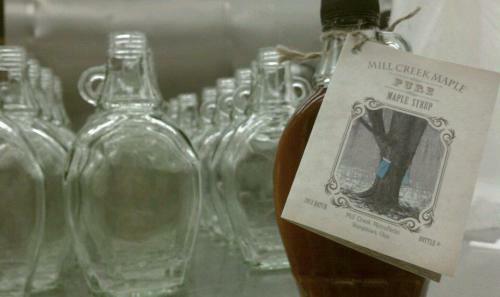 The Rocky Ridge Neighbors would like to thank all the donors and partners who made Mill Creek Maple Syrup possible!